Our Labradors are all English, with mixed Show and Hunting pedigrees. We do not breed any dog that doesn't meet our high standards for health, conformation, and personality. 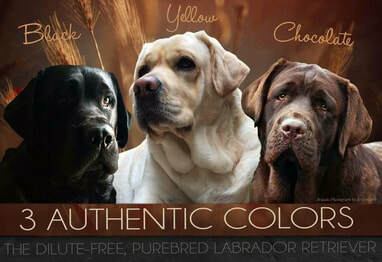 Texas Star Labradors breeds Yellow (White), Chocolate (Classic Dark and Medium variation), and Black labradors. WE DO NOT EVER intentionally breed dilute variations. Contact us at 9728396607 to find out about current puppies, current breedings, or planned breedings. We offer the finest companion and or hunting Labradors available. Located in just outside of Ft Worth in Decatur Texas, Texas Star Labradors is a small personal Labrador Breeder dedicated to the betterment of the breed. We currently produce just a few litters a year. Our dogs must have good Health certifications, DNA Genetics Testing, and OFA Certifications to be considered for breeding. This helps ensure that our puppies get the best start in life we can give them. Whelped inside our home, they remain there until they are 4 weeks old and receive lots of care and socialization. We believe in and love the Breed, and want to ensure the best companion for your home or hunting experience.